Bandung (formerly Dutch: Stad Bandoeng, Sundanese: ᮘᮔ᮪ᮓᮥᮀ, Indonesian: Kota Bandung), is the capital of West Java province in Indonesia and Greater Bandung made up of 2 municipalities and 38 districts, making it Indonesia's 2nd largest metropolitan with 8,495,928 inhabitants at the 2015 Badan Pusat Statistik data. It is the nation's third most populous city, with over 2.6 million (2015). Located 768 metres (2,520 feet) above sea level, approximately 140 kilometres (87 miles) south east of Jakarta, Bandung has cooler year-round temperatures than most other Indonesian cities. The city lies on a river basin surrounded by volcanic mountains. This topography provides a natural defense system, which was the primary reason for the Dutch East Indies government's plan to move the colony capital from Batavia (modern-day Jakarta) to Bandung. The Dutch colonials first established tea plantations around the mountains in the eighteenth century, and a road was constructed to connect the plantation area to the colonial capital Batavia (180 kilometres (112 miles) to the northwest). The Dutch inhabitants of Bandung demanded establishment of a municipality (gemeente), which was granted in 1906, and Bandung gradually developed into a resort city for plantation owners. Luxurious hotels, restaurants, cafés and European boutiques were opened, hence the city was nicknamed Parijs van Java (Dutch: "The Paris of Java"). After Indonesia declared independence in 1945, the city experienced rapid development and urbanization, transforming Bandung from an idyllic town into a dense 16,500 people/km2 (per square kilometer) metropolitan area, a living space for over 8.5 million people. New skycrapers, high-rise buildings, bridges, gardens have been constructed. Natural resources have been heavily exploited, particularly by conversion of protected upland area into highland villas and real estate and, although the city has encountered many problems (ranging from waste disposal and floods to a complicated traffic system and lack of road infrastructure), Bandung still attracts large numbers of tourists, weekend sightseers and migrants from other parts of Indonesia. First Asian-African Conference, also known as the Bandung Conference was hosted in Bandung by President Soekarno in 1955. Bandung will be supporting as one of the host cities of 2018 Asian Games. Current international airport redevelopment is completed in 2016. To improve infrastructure, the construction of Jakarta-Bandung High Speed Rail and Bandung Metro Kapsul, a type of indigenous Automated People Mover (APM) will start in 2017. The new Bandung Kertajati International Airport also will be completed as early as 2018, just in time for the games. Bandung, the capital of West Java province, located about 180 kilometres (110 mi) southeast of Jakarta, is the third largest city in Indonesia. Its elevation is 768 metres (2,520 ft) above sea level and is surrounded by up to 2,400 metres (7,900 feet) (7,874 ft) high Late Tertiary and Quaternary volcanic terrain. The 400 km2 flat of central Bandung plain is situated in the middle of 2,340.88 km2 wide of the Bandung Basin; the basin comprises Bandung, the Cimahi city, part of Bandung Regency, part of West Bandung Regency, and part of Sumedang Regency. The basin's main river is the Citarum; one of its branches, the Cikapundung, divides Bandung from north to south before it merges with Citarum again in Dayeuhkolot. The Bandung Basin is an important source of water for potable water, irrigation and fisheries, with its 6,147 million m³ of groundwater being a major reservoir for the city. The northern section of Bandung is hillier than other parts of the city, and the distinguished truncated flat-peak shape of the Tangkuban Perahu volcano (Tangkuban Perahu literally means 'upside-down boat') can be seen from the city to the north. Long-term volcanic activity has created fertile andisol soil in the north, suitable for intensive rice, fruit, tea, tobacco and coffee plantations. In the south and east, alluvial soils deposited by the Cikapundung river predominate. Geological data shows that the Bandung Basin is located on an ancient volcano, known as Mount Sunda, erected up to 3,000–4,000 metres (9,800–13,100 feet) during the Pleistocene age. Two large-scale eruptions took place; the first formed the basin and the second (est. 55,000 Before Present) blocked the Citarum river, turning the basin into a lake known as "the Great Prehistoric Lake of Bandung". The lake drained away; for reasons which are the subject of ongoing debate among geologists. Bandung experiences tropical monsoon climate (Am) according to Köppen climate classification as the driest month precipitation total is below 60 millimetres (2.4 in), bordering with subtropical highland climate (Cfb). The wettest month is February with precipitation total 255.0 millimetres (10.04 in), while the driest month is September with precipitation total 50.0 millimetres (1.97 in). The average temperature throughout the year tends to be cooler than most cities in Indonesia due to the altitude influence. The average temperature throughout the year only has little variation due to its location near the equator. The official name of the city during the colonial Dutch East Indies period was Bandoeng. The earliest reference to the area dates back to 1488, although archaeological findings suggest a type of Homo erectus species had long previously lived on the banks of the Cikapundung River and around the old lake of Bandung. During the seventeenth and eighteenth centuries, the Dutch East Indies Company (VOC) established plantations in the Bandung area. In 1786, a supply road connecting Batavia (now Jakarta), Bogor, Cianjur, Bandung, Sumedang and Cirebon was constructed. In 1809, Napoleon Bonaparte, French Emperor and conqueror of much of Europe including the Netherlands and its colonies, ordered the Dutch Indies Governor H.W. Daendels to improve the defensive systems of Java to protect against the British in India. Daendels built a road, stretching approximately 1,000 km (620 mi) from the west to the east coast of Java, passing through Bandung. In 1810, the road was laid down in Bandung and was named De Groote Postweg (or the 'Great Post Road'), the present-day location of Asia-Afrika Street. Under Daendels' orders, R.A. Wiranatakusumah II, the Chief Administrator of the Bandung regency at that time, moved office from Krapyak, in the south, to a place near a pair of holy city wells (sumur Bandung), the present-day site of the city square (alun-alun). He built his dalem (palace), masjid agung (the grand mosque) and pendopo (public-official meeting place) in the classical Sundanese orientation, with the pendopo facing Tangkuban Perahu mountain, which was believed to have a mystical ambience. In 1880, the first major railroad between Batavia and Bandung was completed, boosting light industry in Bandung. Chinese flocked into the city to help run facilities, services and as vendors. The area adjacent to the train station is still recognisable as the old Chinatown district. In 1906, Bandung was given the status of gemeente (municipality) and then twenty years later stadsgemeente (city municipality). Beginning of time the early 1920s, the Dutch East Indies government made plans to move their capital from Batavia to Bandung. Accordingly, during this decade, the Dutch colonial government commenced construction of military barracks, the central government building (Gouvernments Bedrijven, the present-day Gedung Sate) and other government buildings. However, this plan, was cut short by World War II, after which the Dutch were not able to re-establish their colony due to the Indonesian Declaration of Independence. The fertile area of the Parahyangan Mountains surrounding Bandung supports productive tea plantations. In the nineteenth century, Franz Junghuhn introduced the cinchona (kina) plant. With its cooler elevated landscape, surrounded by major plantations, Bandung became an exclusive European resort area. Rich plantation owners visited the city on weekends, attracting ladies and business people from the capital, Batavia. Braga Street grew into a promenade street with cafés, restaurants and boutique shops. Two art-deco style hotels, Savoy Homann and Preanger, were built in the vicinity of the Concordia Society, a club house for the wealthy with a large ballroom and a theatre. The nickname "Parijs van Java" was given to the city. After the Indonesian Independence in 1945, Bandung was designated the capital of West Java province. During the 1945-1949 independence struggle against the Netherlands seeking to retake its colonies in the "Dutch East Indies", some of the heaviest battles occurred in and around Bandung. At the end of World War II Dutch troops were virtually absent in Java. To assist the restoration of Dutch sovereignty, the British took a military hold on Java's major cities, and the British military commander set an ultimatum for the Indonesian combatants in Bandung to leave the city. In response, on 24 March 1946, much of the southern part of Bandung was deliberately set alight as the combatants left; an event known as Bandung Lautan Api or the 'Bandung Sea of Fire'. In 1955, the first Asian-African Conference - also known as the Bandung Conference - was hosted in Bandung by President Soekarno, and attended by the heads of states representing twenty-nine independent countries from Asia and Africa. The conference venue was at the Gedung Merdeka, the former Concordia Society building. The conference announced 10 points of declaration for the promotion of world peace promotion and for opposition against colonialism, and is known as the Declaration of Bandung. This was followed by a wave of nationalism movements around the globe which remapped world politics. The conference was also the first international conference of people of color in the history of mankind. Richard Wright in his book, The Color Curtain, claims that there was epic meaning of the conference for people of color around the world. In 1987, the city boundary was expanded by the 'Greater Bandung' (Bandung Raya) plan; with a relocation of higher concentration development zones outside the city in an attempt to dilute population density in the old city. During this development, the city core was often uprooted, with old buildings torn down, lot sizes regrouped and rezoned, changing idyllic residential areas to commercial zones with bustling chain supermarkets, malls, banks and upscale developments. In 2005, an Asian-African Conference was partly held in Bandung, attended by world leaders such as Indonesian President Susilo B. Yudhoyono, President of China Hu Jintao, Prime Minister of India Manmohan Singh, President of South Africa Thabo Mbeki, President of Nigeria Obasanjo, and other luminaries. The city area in 1906 was 19.22 square kilometres (7.42 square miles) and by 1987 it was expanded to 167.2965 km2. The city administration is divided into 30 districts (kecamatan) and 153 villages (kelurahan). For development purposes, the 30 districts are grouped into 8 sub-city regions. The sub-city regions of Bandung are Arcamanik, Cibeunying, Kerees, Kordon, Gedebage, Ujungberung, Bojonagara and Tegalega. The mayor (walikota) leads the city administration. Since 2008, city residents have directly voted for a mayor; previously mayors were nominated and selected by the city council - the Regional People's Representative Council (DPRD). As of 2003, the total number of city administration personnel was 20,163. In 2005 the population of Bandung was 2,290,464, with a density of 13,693/km2 (35,465/sq mi). The May 2010 census enumerated 2,394,873 people,. Based on data from the Indonesian Statistics Department, the population of Bandung in 2014 was 2,470,802 - making Bandung the third largest city in Indonesia. The Majority of Bandung's population are of Sundanese descent. Javanese are the largest minority and mostly come from nearby Central Java and the eastern part of Java. Other minorities include Minang, Minahasan, Chinese, Batak, Malay, Korean, Indian, and Japanese. Bandung also possesses significant international communities, compared with other Indonesian cities. Bandung is home to numerous examples of Dutch colonial architecture; most notably the tropical Art Deco, dubbed New Indies Style. Henri Maclaine-Pont was among the first Dutch architects to recognise the importance of combining each architectural style with local cultural traditions. He stressed that modern architecture should interact with local history and native elements. In 1920, Pont planned and designed buildings for the first technical university in the Dutch East Indies, Technische Hogeschool te Bandung (the present-day Institut Teknologi Bandung), after which he was named as a Professor of Architecture at the university. A striking local Sundanese roof style is clearly seen adorning the top of the campus' ceremonial hall, and is embedded in his artwork. In the same year, another Dutch architect J Gerber designed Gouverments Bedrijven (Government Companies) in line with the colonial government plan to move the capital from Batavia to Bandung. The building is an example of a harmonious mixture between West and East architectural styles, particularly the Italian Renaissance style of arch structures in the wings and pendopo-like structures commonly found in Java in the middle section. 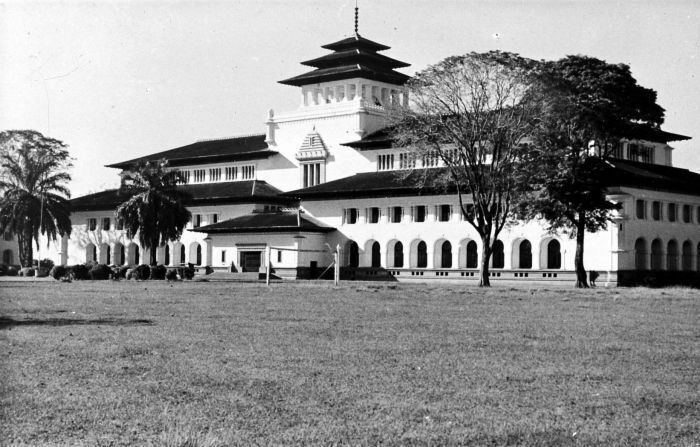 The building is known as Gedung Sate, named after the distinguished small satay-shaped structure on the roof, and is today used as the head office of the West Java provincial government and House of Representatives. The architectural blending of modern and native traditional was followed by several Dutch architects who shaped the city landmarks. 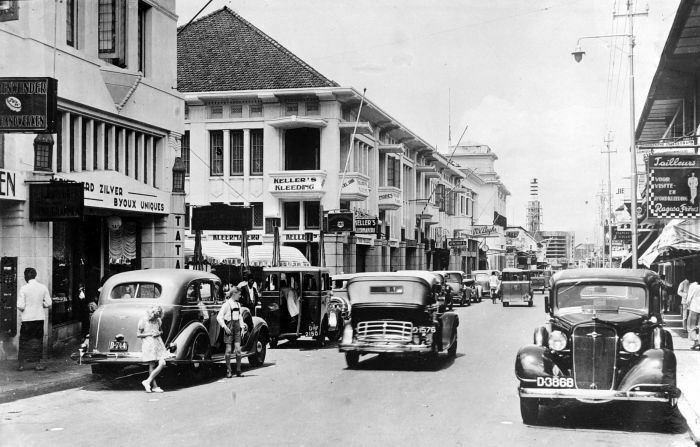 In the 1930s, Bandung became known as an architectural laboratory due to the many Dutch architects who experimented with new architectural designs. Albert Aalbers added the streamline moderne style to the Art Deco by designing the DENIS bank (1936) and renovated the Savoy Homann Hotel (1939). C.P.W. Schoemaker was one of architects who strongly added native elements in his artworks, including the Villa Isola (1932), Hotel Preanger (1929), the regional military headquarter (1918), Gedung Merdeka (1921) and ITB Rectorate Building (1925). Though Bandung is known for its large number of old Dutch architecture buildings, the city is going through high rise building boom recently. At present there are more than 100 high rise building in the city and many more under construction or planned. The following list includes buildings in Bandung, which are completed or topped off and which are above 300 ft?91 meters. 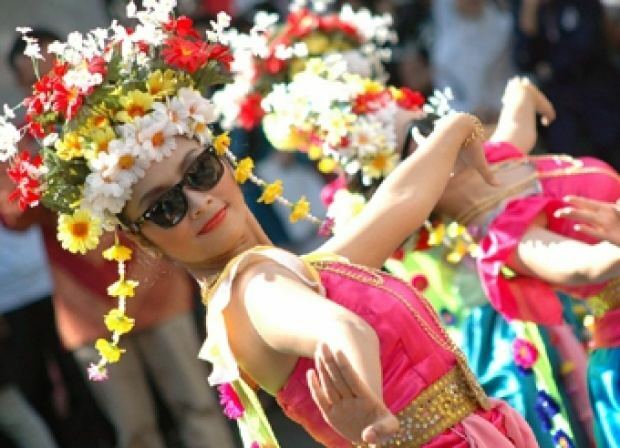 Bandung is considered a major & significant cultural hub in Indonesia. Most people in the surrounding province of West Java are Sundanese. Sundanese language is often spoken as the first language and is commonly used as informal language for communication in streets, school, campus, work and markets, while Indonesian—Indonesia's national language and a lingua franca among its many ethnic units—is used as the lingua franca, the official language and the language of government, businesses, and instruction at schools. Bandung is a popular weekend destination for residents of Jakarta. The cooler climate of the highland plantation area, the varieties of food, the cheaper fashion shops located in factory outlets and distros, golf courses, and the zoo, are some of the attractions of the city. Bandung is also a popular shopping destination due to cheap textile and fashion products, especially for Malaysian and Singaporean tourists. In the 1990s, local designers opened denim clothing stores along Cihampelas Street, which was transformed into a "jeans street". The city attracts people from other big cities to buy local fashion wares, as they are cheaper than branded items. Beside at Cihampelas Street, many factory outlets also opened at Riau Street, Setiabudi Street, and Djuanda Street (known as Dago). Textile factories on the outskirts of Bandung have opened factory outlets on site selling what is marketed as sisa export (rejected or over-produced export quality items). Bandung Supermal, Bandung Indah Plaza, Ciwalk (abbreviation of Cihampelas Walk) and Paris van Java are popular shopping centres in Bandung. To view the Bandung Basin clearly in its mountain surroundings, visitors travel to the Bongkor protected forest area (kawasan hutan lindung), Saung Daweung and Arcamanik; to the slopes of West Manglayang Mountain in an area known as Caringin Tilu, with entry from Padasuka and Cicaheum to the north. The forest is located in 1,500 metres (4,900 feet) above sea level and is covered with pine trees managed by a government corporation Perhutani and can be accessed with 30 minutes drive from downtown. Visitors going to the north of the city also find Taman Hutan Raya Ir. H. Djuanda. The Cicaheum area also hosts Bukit Moko, a tourist spot famous for its views and its steel statue of a giant star called Puncak Bintang. Bandung has several museums that should be visited by tourists, such as the Geological Museum of Bandung, the Indonesia Postal Museum, Sri Baduga Museum, and the Asian-African Conference Museum. Bandung is the home town of the Persib Bandung football team, the most successful Indonesian football team in Asian competition and the Indonesia Super League. A second team Pelita Bandung Raya, also plays in the Indonesia Super League. Other popular sports in Bandung include badminton. The JNE Bandung Utama competes in the Indonesian Basketball League and plays its home games in the GOR Citra Arena. The roads leading up to Lembang and Dago are popular routes for mountain cycling during the weekend, especially since Jalan Ir.H.Djuanda is zoned for car free day on Sunday mornings. In the hills around Bandung, there are several golf courses. Bandung has several local daily newspapers, including Pikiran Rakyat, Galamedia and Tribun Jabar. Several national and local television stations operate in Bandung, including Trans 7, Trans TV, NET., tvOne, RCTI, SCTV, Indosiar, ANTV, MNCTV, Global TV, Metro TV, RTV Bandung (a Rajawali Televisi Network), Kompas TV Jawa Barat (a Kompas TV Network), and TVRI. Many radio stations broadcast from Bandung. Cable TV is widely available by several service providers serving wide range of international channels such as CNN, BBC, Fox (channel), MTV, CGTN, NHK, SBS and many more. Bandung was featured in the 9th and 10th leg of the American reality series The Amazing Race 23. Bandung can be accessed by highways from Jakarta. An intercity toll highway called Cipularang toll road, connecting Jakarta, Karawang, Purwakarta, Padalarang and Bandung, was completed in May 2005 and is the fastest way to reach Bandung from the capital by road. Driving time is about 1.5 hours on average. There are three other options: the Puncak route (Jakarta-Cianjur/Sukabumi-Bandung), Purwakarta route (Jakarta-Cikampek-Purwakarta-Cikalong Wetan-Padalarang-Cimahi-Bandung) and the Subang route (Jakarta-Cikampek-Subang-Lembang-Bandung). From cities further east (Cirebon, Tasikmalaya and Central Java province), Bandung can be accessed through the main provincial road. Indonesian National Route 3 links Bandung with the rest of Java towards Cilegon and Ketapang (Banyuwangi). The Pasupati Bridge was built to relieve traffic congestion in the city for east-west transport. The 2.8-kilometre (1.7 mi) cable-stayed bridge lies through the Cikapundung Valley. It is 30 to 60 metres (98 to 197 feet) wide and, after extensive delays, it was finally completed in June 2005, following financial investment from Kuwait. The bridge is part of Bandung's comprehensive inner-city highways plan. Taxis and mobile apps transport are widely available. The primary means of public transportation is by minibus, called angkot (from angkutan=transportation and kota=city). They are privately operated and cheap, serving multiple routes throughout the city, but are basic transport and not known for being comfortable. To find exact angkot routes, information is available through the drivers or at terminals. City-owned buses, called DAMRI, operate on longer high capacity routes. Bandung has 2 intercity bus terminals: Leuwipanjang, serving buses from the west, and Cicaheum, serving buses from the east. Both are at full capacity and are to be replaced by a new terminal at Gedebage on 15 hectares land, after which the old terminals will function as inner city terminals. The new terminal will be located next to the Gedebage railway station near of Gedebage container dry port. Bandung Husein Sastranegara International Airport serves direct domestic flights to Batam, Pekanbaru, Medan, Bandar Lampung, Surabaya, Yogyakarta, Denpasar, Semarang, Banjarmasin, Makassar, and also international services to/from New York City, London, Tokyo, Amsterdam, Barcelona, Houston, Stockholm, Los Angeles, Seoul, Hong Kong, Shanghai, Beijing, Maldives, Honolulu, Sydney, Perth, Johannesburg and many other destinations via Kuala Lumpur and Singapore. The airport is located near the Dirgantara aerospace complex and Dirgantara Fairground. Bandung has two large railway stations, Bandung and Kiaracondong Stations. Other smaller stations are Cimindi, Andir, Ciroyom, Cikudapateuh, and Gedebage Stations (only for freight service). Railway lines connect Bandung to Cianjur, Jakarta, Purwakarta, Bekasi, Karawang and Cikampek to the west, and Surabaya, Malang, Yogyakarta and Solo to the east. It is also a major means of transportation for people living in the suburban areas of Cimahi, Padalarang, Rancaekek, Cicalengka and Cileunyi. In 2012 Bandung Commuter Train phase-1 was scheduled to be built to connect Padalarang, Cimahi, Bandung and Cicalengka with 13 Trans Metro Bandung bus corridors to serve as feeders. Phase-2 will connect Cicalengka to Jatinangor. 32 bus shelters for Trans Metro Bandung (similar to TransJakarta) along Soekarno-Hatta street were finished in August 2011 at a cost of Rp13.1 billion ($1.54 million). Thirty additional buses joined the existing operation of 10 buses, after all the shelters were finished. On 21 June 2011 Damri launched two buses on the Cibiru-Kebon Kelapa specially for women passengers only with women drivers. On 5 August 2011 Jusuf Kalla announced that he would like to build a monorail in Bandung with value of Rp4 trillion ($470 million). As of April 2012, a cable car project 'Bandung Skybridge' to connect Pasteur (Cihampelas) to Sabuga (Taman Sari) was said to be 90 percent complete and awaiting legal authorization to operate. However, as of 2016, the project has still to be realised. To ease Cihampelas traffic congestion, a skywalk for pedestrians only from Cihampelas to Tamansari was built with budget of Rp45 billion. The skywalk, named Teras Cihampelas, was inaugurated by the mayor of Bandung, Ridwan Kamil, on 4 February 2017. Vehicles will be able to be parked at Tamansari. Bandung City has also announced an intention to build LRT (Light Rail Transit). There are hundreds of public and private schools in Bandung and several state-funded and administered Junior High Schools (SMP Negeri) and State High Schools (SMA Negeri). At least sixteen universities—three of which are state-owned—and 45 professional schools are scattered across the city. Education from social sciences and technology to tourism education can be found at one of those universities. Among the universities located in Bandung are: Institut Teknologi Bandung (Bandung Institute of Technology), Universitas Padjadjaran (Padjadjaran University), Parahyangan Catholic University, Universitas Islam Bandung, (Bandung Islamic University), Universitas Kristen Maranatha (Maranatha Christian University), Universitas Islam Nusantara (Nusantara Islamic University), Universitas Pendidikan Indonesia (Indonesia University of Education), Universitas Islam Negeri Sunan Gunung Djati (Sunan Gunung Djati Islamic State University), Universitas Pasundan (Pasundan University), Institut Teknologi Telkom (Telkom Institute of Technology), Politeknik Negeri Bandung (Bandung State Polytechnic), and Sekolah Tinggi Pariwisata Bandung (Bandung Institute of Tourism), all being considered among the best universities in their respective fields of specialty in Indonesia. Established 1920, Institut Teknologi Bandung is Indonesia's oldest and most prestigious technical university. Universitas Pendidikan Indonesia (formerly IKIP Bandung, established in 1954) is one of the first institutions of higher education established after Indonesian independence and is currently a leading education university in the country. Universitas Padjadjaran (established in 1956) is considered to be one of the best universities in the country in the fields of Medicine, Law, Communication, and Economics. In the north of Bandung, Bosscha Observatory is the only observatory in Indonesia. Construction of the observatory began in 1923 and was completed in 1928. In 1922, the first international publication from Bosscha Observatory was published and in 1959, the observatory was absorbed as a part of the Department of Astronomy at Institut Teknologi Bandung (The Bandung Institute of Technology). The Bandung economy is mainly built upon tourism, business, creative industry, hi-tech & manufacturing industries, educational institutions, technology, retail services, financial services, pharmaceutical companies, and food production. Bandung has nearly 50 higher educational institutions and is among the most popular destination for education in Indonesia. The once quiet residential district of Dago has become an important business and entertainment centre with chic cafés and restaurants spread out along Dago Street. In the early 1990s Cihampelas Street became a popular clothing store location and remains so to this day. Creative culture has shaped some of the Bandung economy. Small businesses known as "distro" sell non-trademarked products made by local designers. Books, indie label records, magazines, fashion products and other accessories are typical distro products. Distros are popular with young people and distance themselves from factory outlets in term of philosophy. Distros arise from individual designers and young entrepreneurs, while factory outlet products are from large scale garment factories. The north of the city serves as a water reservoir for Bandung's two million people, however, the area has seen substantial residential development. Several attempts to protect this area have been made, including the creation of reserves such as the Juanda National Park and Puncrut, but development continues. Regular flooding in Bandung's south also presents a real and dangerous ongoing problem. From mid-2005, Bandung faced another environmental disaster, when the city's land fill site was reevaluated after a garbage slide in 2005 which buried a village, Kampung Gajah, beneath it, killing over a hundred people. The accumulation of 8,000 m3/day of domestic garbage piled up, causes severe air pollution by local burning, the spread of disease, and water contamination. The provincial government has so far failed in its attempts to solve the garbage issue. The city also suffers from air pollution, being located in mountain "bowl" and surrounded by mountains, it can be covered by smog. Despite that, frequent rain in rainy season clears the smog that covers the city and freshens the air. The rate of lead in the atmosphere per cubic meter can exceed the tolerable limit. Studies have shown traces of lead in the blood of students in excess up to 10 times the tolerable limit. Pollution has produced acid rain already for a number of years (pH 5.6). 1997: Adipura Award – for the achievement of the cleanest city in Indonesia. 2015: Adipura Award – for the achievement of the cleanest city in Indonesia. The Adipura consists of a trophy and an award.